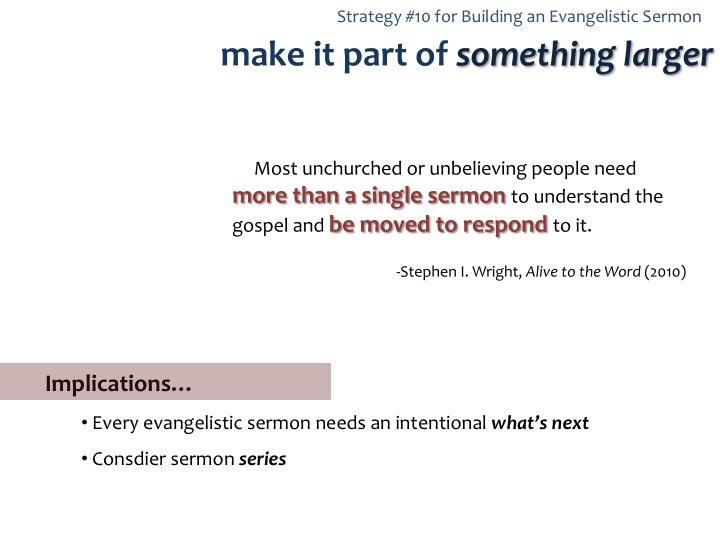 Evangelistic Preaching (Part 13) — Strategy Wrap-Up – Practical. Catholic. 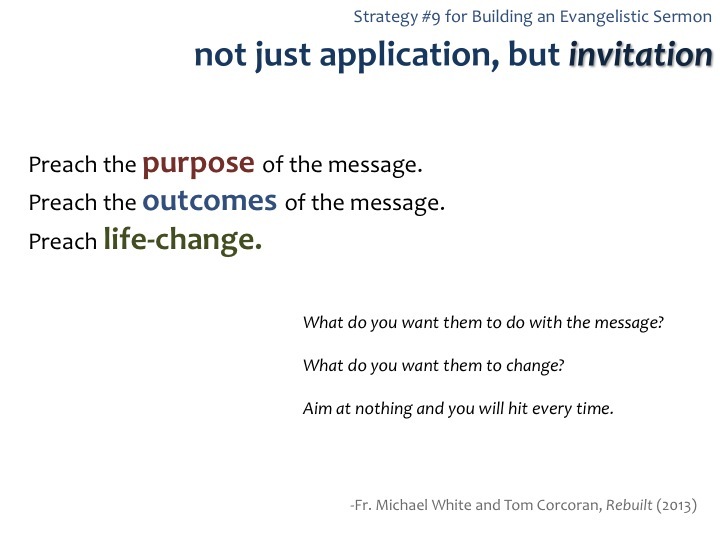 Evangelization. This is the thirteenth post in a series on evangelistic preaching in Catholic contexts. The use of narrative structures in preaching, pioneered by homileticians such as David Buttrick, Fred Craddock, Thomas Long, and Eugene Lowry, has proved tremendously important for Catholic Eucharistic preaching since the Second Vatican Council—and for good reason, a faith community gathered for the Eucharist is participating in a meta-narrative that includes both the mystical and visible elements of Christianity. However, for the potential hearers of evangelistic sermons, this narrative is largely unknown and in a culture that displays tendencies of becoming increasingly episodic, rather than narrative in thinking, other sermons structures—i.e. expository, textual, declarative, dialectical, rhetorical, polar opposites, pragmatic, topical, quadrilateral, etc.—may be better suited for evangelistic preaching. Why not give some other structures a try? Stephen Wright observes a commonsense reality–response to the Gospel usually takes more than one pitch, more than one message. And, given our Catholic theology of the breadth of evangelization, we understand that any decision that flows from hearing an initial proclamation is just a starting point, not the final outcome. An initial encounter requires on-going conversion and life in the Christian community. Because of this, every evangelistic sermon should include an intentional what’s next—a clear step or follow-up action or opportunity for those who may have encountered Jesus Christ and are seeking a way to respond. It also points to the potentially fruitful use of series in evangelistic preaching, so that the preacher can offer multiple topics and build a relationship with a hearer. 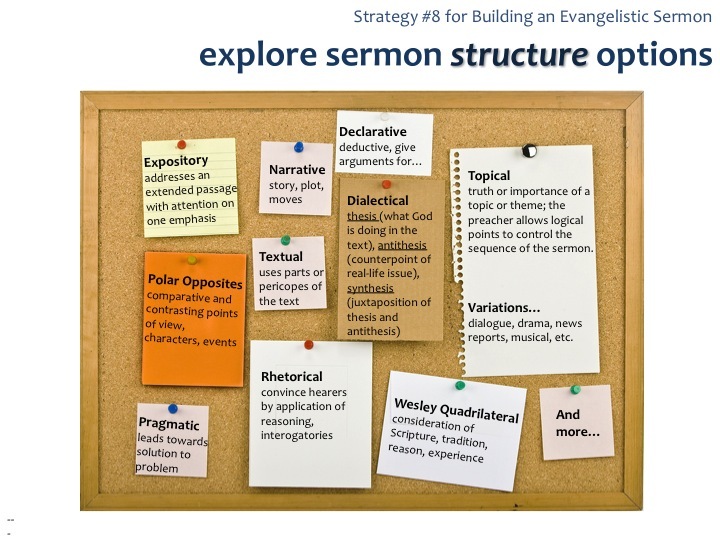 Okay, so those are my top 10 strategies for preparing homilies [or sermons, or messages] with evangelization in mind. I’m not going to claim that these ten practical strategies for Catholic evangelistic preaching are the only techniques, but they are at least a solid a starting point, and every preacher will develop his or her own preferred methods and techniques. The underlying premise is intentionality, not just choosing one technique or imitating a particular preaching, but truly applying ourselves to the task of evangelizing our preaching. As the Venerable Paul VI wrote, “ evangelizing preaching takes on many forms, and zeal will inspire the reshaping of them almost indefinitely”—it’s our job to figure out how. Thomas G. Long, “Out of the Loop” in What’s the Shape of Narrative Preaching? Essays in Honor of Eugene L. Lowry, ed. Mike Graves, David J. Schlafer, and Eugene L. Lowry, (Saint Louis, MO: Chalice Press, 2008), 126. Michael White and Tom Corcoran, Rebuilt: The Story of a Catholic Parish: Awakening the Faithful, Reaching the Lost, Making Church Matter, (Notre Dame, IN: Ave Maria Press, 2013), 144.